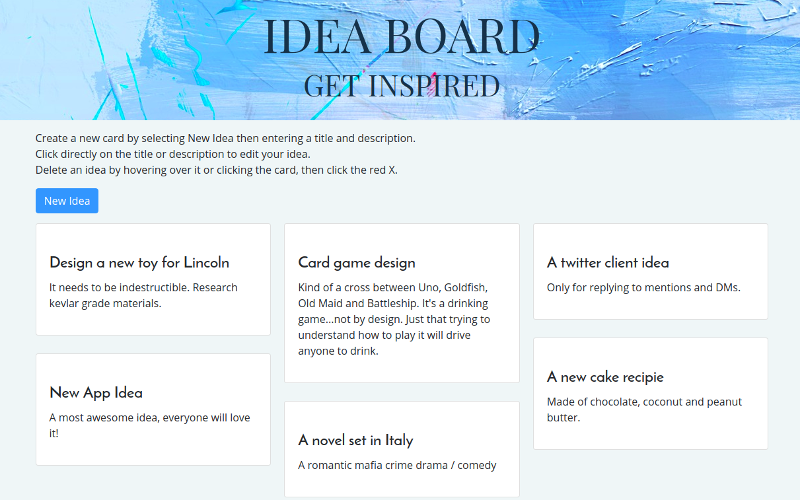 I am super excited to get my Idea Board app up and running! After completing the React lessons on both FreeCodeCamp and CodeCademy, the next thing I needed to do was create a project. I really wanted to get started on my Vacay app right away, but after staring at it for awhile, I realized I needed some hands on with a tutorial to get me started. It took awhile to find something interesting, but got my hands on the Idea Board tutorial app on Learnetto and was off and running. Following along, I was pretty happy to be able to understand everything, but just as I was feeling very confident, the very last task, adding the delete button, tripped me up and I could not for the life of me get it to work. After getting myself frustrated, I walked away from it, and when I looked at it again I immediately saw a typo and boom…done! So thankful to have learned to push away and clear my mind, because if I hadn’t, I would still be here staring at it and pulling my hair out. Taking a little break is a good thing! Anyway, in true Candice style, once I was done and my moment of victory wore off, I started thinking of all the things I could do to take things a step or two further. I’m going to keep working on it and adding features along the way.